“Brighton Rock”, first published in 1938, was a product of the quill pen wielding Graham Green, whose work, sordid as it was, brought about a couple of gangter odysseys starring Pinkie Brown, a young brute with a mop of hair that spilled over his forehead like a young Jimmy Cagney. “Brighton Rock”, here, in its second film adaptation since 1947, is an interesting, sometimes torpid, version of Green’s monochrome interpretation of the English underworld. The pallet is pretty dry, with a revolving door of grays and blacks, that are, quite obviously, indicative of the story’s grim mood. Much of the movie is pretty easily digested, with nothing notably menacing happening, which is, partly, a reason why it underachieves in reinforcing its dramatic arc. The story is pretty superfluous, even for a gangster story, and seems flatter than a can of week old pop. Moreover, the action, when it does transpire, looks wrought with unrefined camerawork and poor dialogue. 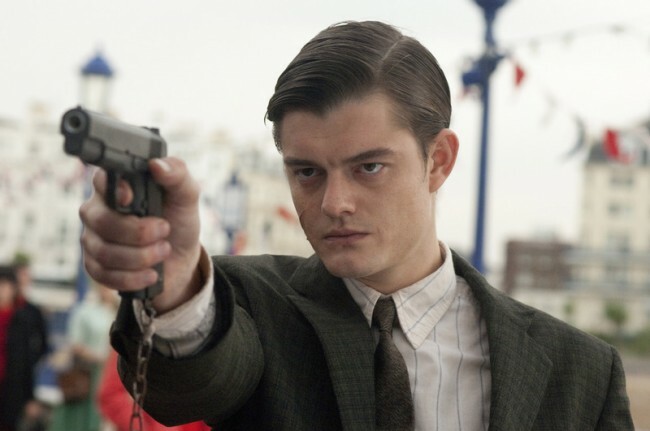 The hiccups are aplenty, but the acting of Sam Riley, who plays Pinkie Brown, is one of the best casting decisions for a movie in recent years. Riley’s steely mug is a cross between Leonardo Dicaprio and a block of granite; he has a shady brow that only a noir rag could love. One look at Riley’s face and you see a sweat drenched youth with colder eyes than an ice box. Not only is the slimy and era appropriate look of Riley, with his indignant look of uncertainty, the flagship of the film, but the slinky actor’s performance, in all of its smarmy believability, carries the weight of the “Brighton Rock”, like ballast in the belly of a ship, to its port of call. There isn’t a sense of scalability in the film, but if there was, Riley would be the flame that brought about the light. The story revolves around a young thug, who, as we’ve established, is Pinkie Brown. The degenerate has the tenacity of Andrew Carnegie and the weathered fists of a dock worker. Pinkie manages to slice-and-dice one of his foes, unfortunately, in a public place. The drawback to this impassioned act of violence is that a doe-eyed girl, who saw the crime, is a prime witness to the murder. Pinkie manages to court the girl, in an attempt to protect his identity, and he mostly succeeds. The characters, for allegedly being serpentine and nefarious, aren’t very interesting. They generally sit, argue, then drink tea. The alphabet that drops from their mouths isn’t very quotable, and therefore none of the exchanges between characters seem to be very relevant. Luckily for us the movie has the brevity of a Hardy Boys book, so the story doesn’t drag its heels in getting to the ending. A pedestrian score, that toe taps its way around being outrageously inane, wraps itself around the film like a piece butcher paper to a slab of gamy meat. The music in the movie sounds like an unused Bernard Herrmann score from a lost Hitchcock film – and even that is giving it too much credit. “Brighton Rock” isn’t without merit, thankfully, and at least the clothes and locations look lived in. But with that said, not all of the gritty mood and notable cast members – the cantankerous John Hurt and regal Helen Mirren – can save this movie from an abysmal finale. At an hour-and-twenty-minutes I had felt as though we were stuck in the first fifteen-minutes of the film, waiting for character development, a motive for our characters. No, Riley cant bail water from this sinking ship fast enough to warrant a ticket to the theater. “Brighton Rock” was made twice – maybe the third time is a charm?